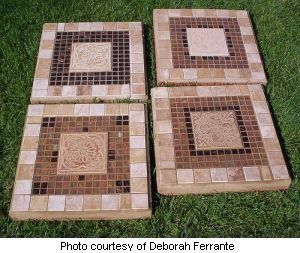 Mosaic stepping stones or mosaic pavers are another great project. You will need a few supplies for this, some of which you probably already have at home. The supplies needed also depend on the method you choose to make your mosaic pavers. There are two methods to make mosaic pavers. On method is with a mold and the other is using a concrete patio stone. The mold can be anything made of plastic, like plastic food containers or plastic flower pot saucers, these will work fine. The important thing to consider is the depth of mold, remember you will be walking on these so they should be at least 2 inches deep, unless you are going to make them for decorative uses. Another option is to purchase your mosaic mold online or at you local craft store where you will find many shapes and sizes. Make your stepping stone using the direct method. You can lay out your design first on a cardboard cut to size. Experiment with different tiles and shapes on your piece of cardboard. Once you are satisfied with the design, then use either method described below to make your mosaic pavers. You can use any mosaic art pattern for you paver, there is no specific pattern to use. You can also just randomly place your tile pieces and see what comes up! Now to make a mosaic stepping stone, prepare your mosaic mold by greasing it with petroleum jelly to help release the stepping stone from the mold when it has cured. Fill the mold with the concrete and tap the sides to help it set and to remove possible trapped air bubbles. Now let it set for about 30 minutes. It can take longer, it all depends on the humidity level in your concrete and the ambient temperature. The reason you are doing this is so the pieces of tile will not sink in the wet concrete. When the concrete has set a little start placing your tiles, or whatever materials you are using, into the wet concrete. A trick I use to help even out the pieces in the wet concrete is to use a dry wall float and gently press the tiles in the concrete. When the concrete has completely cured, usually about 2 days, remove the mosaic stepping stone from its mold. Then seal the entire tile with a grout and tile sealer. With this method, instead of making your stone yourself, just buy a patio stone at your local home center. They come in many sizes and shapes. However you will need to grout stepping stone using this method. To make your stepping stone just spread the mortar on your concrete patio stone and transfer all the tiles from the cardboard to your stone. If you are using liquid nail as an adhesive then just glue your pieces of tile one by one on your patio stone. Then you will grout and seal your mosaic pavers. For detailed instruction you can see the gluing, grouting and sealing sections in the how to lay tile page. 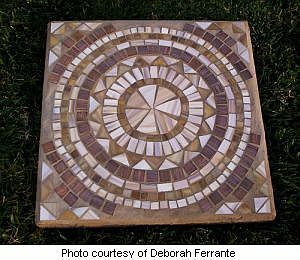 Now that you have finished your first mosaic stepping stone you can start preparing the next one.